Just a quick note: I’ve got a 2-part Halloween post on the Canary Review on a particular habit of mine. I didn’t mean for it to become an annual tradition, but it’s been happening every year since I was a kid, and there comes a time when you just need to accept it. Part 1 is up as of the last time I checked. I go by Pirate Canary there, so check it out! Leave a comment, too–there was a pretty interesting discussion in the last post I wrote there about approaching comic books as a writer vs. an artist, and I’d love to see more people sharing thoughts. I’m up on The Canary Review again to continue the conversation on Banned Books. I think it’s important to consider why we ban or challenge books, and what that says about their power. Plus, tCR is a cool blog, with plenty of interesting thoughts on books, banned and otherwise. So what’s cool is that it’s possible that there will be a new Canary appearing soon whose writing style bears a strong similarity to mind. Striking, even. This blog is going to keep plugging away, but you might want to check out The Canary Review twice a month or so. Just sayin’. First off, I have exciting news: I’ve been invited to write my very first guest blog post! The Canary Review has just posted the first article in a series about the best and worst books people have read, written by yours truly. I’m completely thrilled, and I invite you to check out the Canaries and what they have to offer! Conversely, should you happen to have made your way here from The Canary Review, I am happy you are here! I would put out cookies and juice for you, but I can’t, because we are on the Internet. So instead, I will tell you about a book. 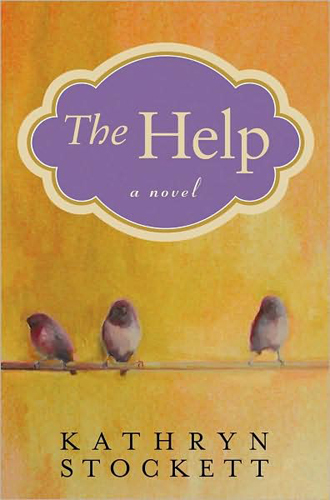 I just finished The Help, by Kathryn Stockett, and I feel a little awkward about the timing of this announcement, since it’s pretty obvious that I’m reading it in order to go see the movie properly, but whatever. It’s an awesome book, and I want to tell you about it, so you can read it and see the movie properly. The original cover of a book is always better than the movie cover. The Help moves between the voices of three women living in Jackson, Mississippi in the 1960s: Aibileen, Minny, and Skeeter. Aibileen and Minny are both black maids–Aibileen is caring for her seventeenth white child, which sometimes slightly eases and sometimes amplifies the pain of losing her only child a few years before. Minny is working to support her own family, but has cycled through multiple jobs because she cannot be the calm, restrained, half-invisible person her employers want her to be (which, incidentally, makes her tremendous fun to read). Skeeter is white and newly returned to Jackson from college with dreams of being a writer. Distance has given her a little needed perspective, and she has come up with an idea. Skeeter’s idea to write a tell-all book about the lives of black domestic help, interviewing maids to get her stories, doesn’t start out as an altruistic project. She has a vague idea that the book could change things, but sees this as a warm, positive benefit to the larger story of her own developing success. This isn’t so much because she is selfish as it is her continuing naivete, but it makes her transformation particularly interesting. As she realizes the possible consequences the maids face by helping her, even anonymously (various penalties either happen or are suggested, from being blacklisted from work and therefore forced into eventual homelessness, to having tongues cut out by racists), Skeeter begins to see herself as only playing a role in a larger issue of justice. Minny and Aibileen deepen, too, of course. Telling their stories, seeing the effect of the project on other maids, and ultimately seeing the book published is a kind of liberation and a kind of danger that neither woman expected to experience in her life. There are moments of sacrifice and courage and a richer, more meaningful maturity in each of these adult women’s lives by the end of the book. Not because they were immature or complacent before–quite the opposite–but because for them, this story is about claiming power and justice directly, instead of using pranks (Minny) or secret attempts to teach equality and kindness (Aibileen) as substitutes for what they really need. Admittedly, as substitutes go, these are great ones to read–Minny’s revenge is a hair-raiser, and Aibileen’s interactions with Mae Mobley, the two-year-old daughter of her employer, are both tender and powerful. The story is compelling, the characters are meaningful, but I always note the writing style. I am happy to report that The Help is solidly written, as well! One thing in particular was Stockett’s use of dialect. It is incredibly difficult to write eye dialect effectively, without it sounding hokey and condescending. Stockett has the ear, though, and the tact, and Aibileen and Minny get voices that are distinctive and authentic and respected by their author. Major kudos there. In short, as always, I would recommend reading the book before seeing the movie. It’s not just a matter of principle here, though–I can’t speak to the film adaptation (yet) but The Help, the novel is a beautiful, masterful story and well worth every attention and award it can get.